Tip of the left ventricle, which points inferiorly, anteriorly and to the left. 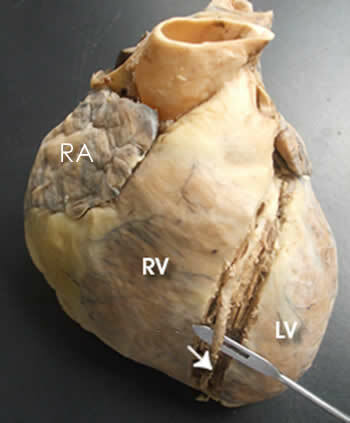 Left atrium lie more posteriorly, and form only a small strip on the sternocostal surface. It is formed by both ventricles (mainly the left). Separated from the liver and stomach by the diaphragm on which it rests. Divided by the posterior interventricular groove or sulcus into a right one third, and a left two-third. This sulcus contains the posterior interventricular artery . The atria, mainly the left one. Notice at this point that the heart does NOT rest on its base; the term ‘base' derives from the conical shape of the heart, the base being opposite the apex . 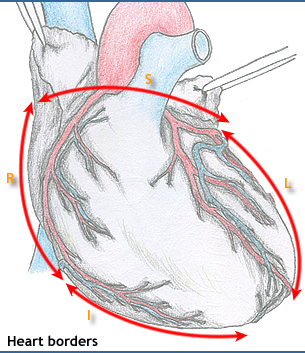 (a) The right border (R) is formed by the right atrium and is in line with the superior and inferior vena cavae. (b) The inferior border (I) , thin and sharp, nearly horizontal. It is formed mainly by the right ventricle, and slightly by the left ventricle near the apex. (c) The left border (L) , formed by the left ventricle and very slightly by the left auricle. (d) The superior border (S) is where the great vessels enter and leave the heart. It is formed by both atria.